The key to successful conversion rates is getting information to the right people at the right time. Internet technology provides businesses the ability to pin-point markets at precise moments. However, if you’re not delivering the right information, the entire effort, investment and process is severely flawed. The Web is a fantastic medium to determine what web writing works and what doesn’t. Recent A/B split tests targeting US and European audiences helped Webcopyplus establish how web writing approaches and styles influence online consumers’ behavior. Reducing text by as much as 50% helped increase conversion rates by as much as four per cent. It’s well documented four out of five people don’t read web writing word-for-word; they skim it. In addition to making it easier for online consumers to scan and gather information quickly, your key messages aren’t buried by unnecessary jargon and dead words. Simply cutting out a few clichés saw conversion rates increase slightly. Clichés, which are often used by writers in an attempt to be cute or clever, do little for online consumers. 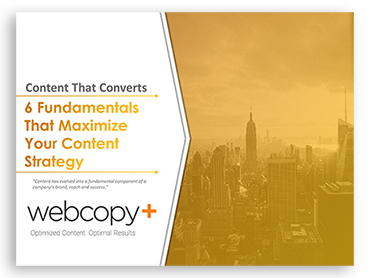 These findings reinforce Webcopyplus’ position that web writers should write exclusively for the intended audience – not themselves or even their clients. Clichés also create cross-culture limitations and issues. Converting ‘we-driven’ text into ‘you-driven’ web writing consistently increases conversion rates. People are generally turned off by self-centered individuals. The same goes with self-centric businesses. Plus, using the personal pronoun “you” naturally lends itself to conveying benefits, which is an effective way to engage people through emotions, and integral to making a sale. Testimonials: use them if you’ve got them. They inspire trust. Even if visitors don’t read the testimonials, simply having them appear on your website builds credibility. Just be sure to include full names, as well as company names where applicable. While testimonials showed just slight conversion improvements, it’s an accumulative process. The many things you do right, however minor, add up to greater results. Each testimonial should contain one or two main points; customer service, efficiencies, cost savings, revenue generation, professionalism and so on. Be sure to keep them brief. If there’s too much to say in a sentence or two, consider adding full-on case studies. Get an employee or writer to interview your customers for testimonials and case studies. It’s an investment that can reap valuable insight and compelling marketing material. What do you want visitors to do? Whatever it is, it’s in your best interest to ask. This single element can help you boost conversion rates by double digits. A salesman that talks, and talks, and talks may have said the right things along the way, but the sales opportunity will eventually cool down and expire. Ask for precisely what you want – call us today, request a free quote or what have you – at the appropriate point, likely at the end of your main body of web copy. You can often include a call for action on your home page, but keep that one relatively subtle. Otherwise you can turn off your visitors, much like an in-your-face, loud-mouth salesman with bad timing and bad breath. Tweak your web writing, analyze the results, and then tweak some more. Precise web writing translates to higher conversion rates.